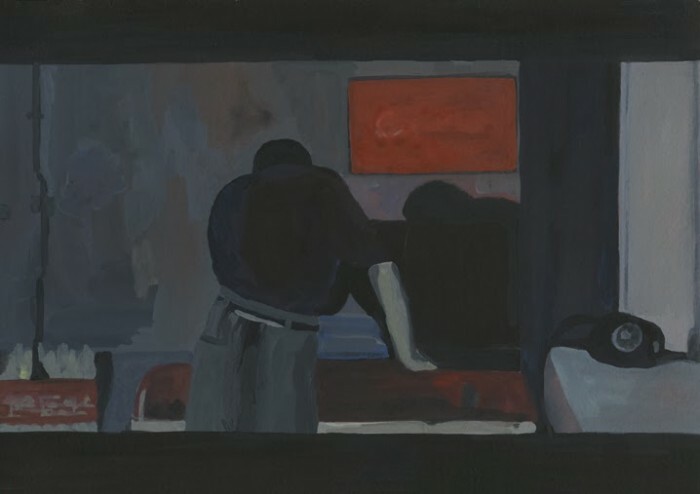 Isabel Theselius, a Swedish artist who works with media images and sculptural ephemera, created a series of paintings based on Wong Kar-Wai films that look as if Edward Hopper had lived and worked in pre-PRC Hong Kong. They are painted in gouache, without the traditional addition of graphite or charcoal for illustrative details, which results in a flattening of an already flat medium-film as projected on a screen-and mimics Wong Kar Wai’s manipulation of color to achieve the desired amount of ennui. 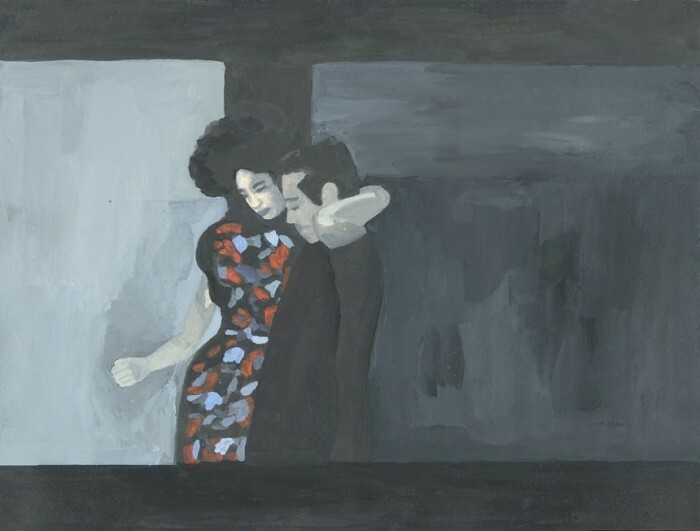 The auteur director Wong Kar-Wai is famous for his use of color and ambient lighting in his films, especially In the Mood for Love, Days of Being Wild, and As Tears Go By, which Theselius captures stills from for her paintings. The reds and greens of street lamps, neon signs, and endless windows in the vertical crush of Hong Kong are made more so by colored filters and push-processing rather than by digital post-shopping. 1960’s Hong Kong may not exist anymore, but the inspiration for this color palette still does-Days of Being Wild is awash in cyans and greens, as if the languid heat of the city drained away the more vibrant warm tones. 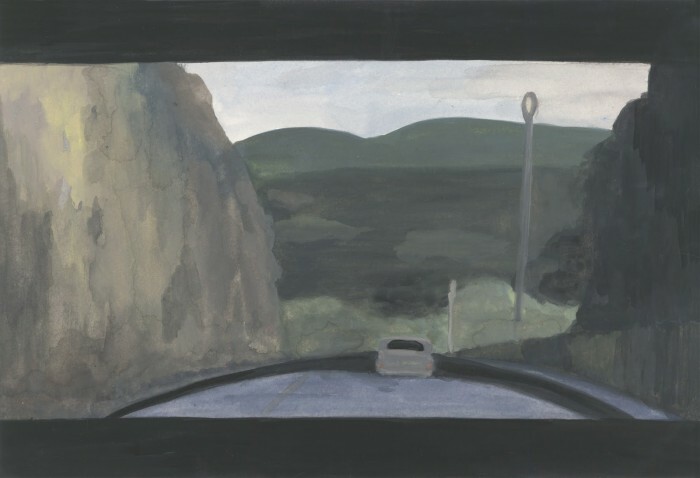 Theselius has made several works that use materials or images that remind us of time passing so her choice of Wong Kar-Wai’s films seems appropriate. “Marseilles Soap and the Bridge” depicts her grandmother taking a bath, blowing bubbles with a thread spool by using her greatly treasured Marseilles soap. “Hej Angels” is an installation of videos and crafted curios created in response to the late Swedish artist BOM Lindén’s fascination with the American road trip. 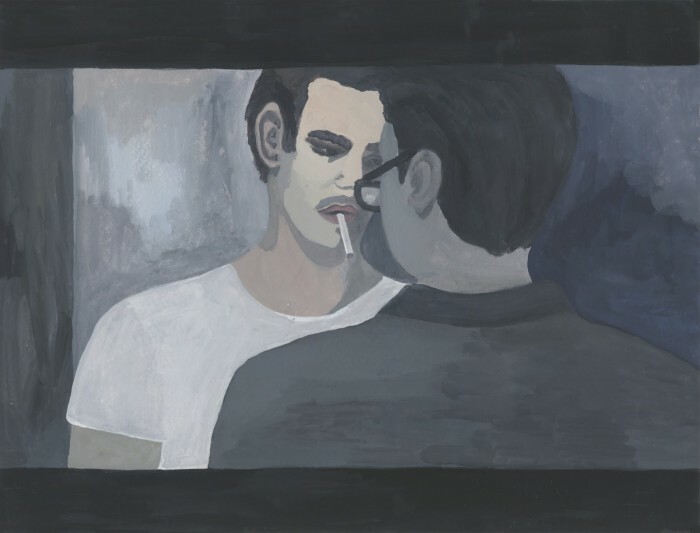 The gouache paintings called “Stills” are done in a medium of remembrance, although they derive from a medium of ephemerality. It is odd to imagine a world where people did not paint from photographs, but indeed, in the mid-19th century photographs were seen as cheaper, more expedient copies of paintings. The French painter Gustave Courbet was criticized in his day not just for his pedestrian subject matter but also for relying on the realism of photographs to frame his paintings. In the 21st century, the importance of a single image has been upstaged by a glut of moving digital pictures. The analog photograph is a dinosaur, living in the shadows of our collective understanding of what we think we see and what we are prompted to imagine. Theselius uses photography as a bridge between screen culture, the dominant visual culture of today, and painting, a primordial ooze of a medium that maintains the greatest resale value of any art form to date. She seems to prize the gravity of a single photographic image over the whole of a film as if the past is still a concept worth valuing in contemporary culture. Is this a dilettante effort to keep time from passing? Nostalgia will always be a popular theme in works of art or literature. What raises a piece beyond that is a critical commentary on our relationship with it. Is the past a lie? Does our longing for the past taint our belief in the verity of photographs, whether that past is real or imagined? Wong Kar-Wai deliberately constructed his fictional historical tableaus like the epic paintings of Eugène Delacroix, and from a visual standpoint they are attractive inventions that prompt real memories to form. A dimly lit street corner becomes a personal turning point in a past relationship; a family owned bodega becomes a small symbol of hope for a happier future. The relationship between painting and photography therefore becomes one of desire. Theselius’s “Stills” present us with a snapshot of our own desire for the story to be more real than the truth. It is an escapist desire unlike photographer Stephen Shore’s “architectural paintings” that were like 3-D sets of banal city blocks. In choosing beauty and artifice over banal reality as subject matter, Theselius has opened herself up to another level of criticism, one that does not rely on irony. We need to be sold on the importance of beauty, and using Wong Kar-Wai, an artist in his own right, is like using a pre-made vision. It would be interesting to see Theselius create the same conversation about photography, painting and temporality, with purely original images. This entry was posted in AALR Online and tagged AALR online, isabel theselius. Bookmark the permalink.